The CDIO approach is an innovative framework for educating the next generation of engineers. The aim is an education that supports students to acquire a deeper working understanding of the technical fundamentals while simultaneously developing the competencies needed for Conceiving – Designing – Implementing – Operating (CDIO) real-world systems, products, and processes. 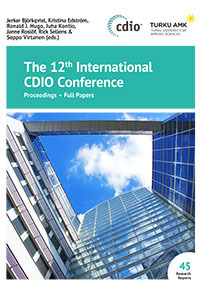 The Annual International Conference is the main meeting of the CDIO Initiative and it includes presentations of papers as well as special seminars, workshops, events and activities. The 12th International CDIO Conference took place in Turku, Finland, June 12–16, 2016, hosted by Turku University of Applied Sciences. This publication contains the 100 accepted full papers that were presented at the conference, of which 14 are Advances in CDIO; 72 CDIO Implementation; and 14 Engineering Education Research. These papers have been written by 283 different authors representing 24 countries. This book is available as an electronic publication only.